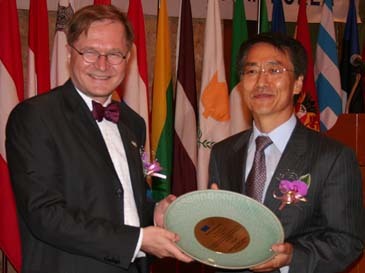 Lee Kyung-Tae (right), president of KIEP (Korea Institute for International Economic Policy), receives a plaque of appreciation from Finland Ambassador to Seoul Kim Luotonen. A special luncheon was held at Lotte Hotel, located in downtown Seoul on July 4, 2006 to explain the advantages and disadvantages of a Korea-EU FTA (Free Trade Agreement). 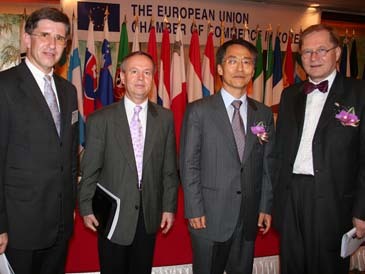 EUCCK (European Union Chamber of Commerce Korea) hosted the event and Lee Kyung-Tae, president of KIEP (Korea Institute for International Economic Policy), was the featured speaker. Finnish ambassador to Korea Kim Luotonen emceed. Many important guests gathered to learn more about the Korean government's perspective on Korea-EU FTA. They were top European business leaders in Seoul, ambassadors from the Netherlands, France and Romania and members of the press. Mr. Lee, president of KIEP, remarked that the Korean government started negotiations on FTA s' with other nations in 2001. He expressed urgency while acknowledging that time was running against them. He noted Korea's gratitude for the EU during the Asian financial crises of 1997. European multinationals bought out Korean corporations that were expected to go bankrupt. Both Korea and EU have good reasons to pursue FTA. EU is Korea's second largest export market behind China but ahead of US and Japan. KIEP issued a report predicting Korea's GDP would increase by 2.02% and 3.08% with imports and exports expanding to US$8.2 billion and $11 billion and domestic employment to rise by 597,000. Mr. Lee doubted that the DOHA talks to introduce global free trade would succeed. Hence, bilateral agreements with other nations have become a necessity. Mr. Lee stated that FTA with Chile and Singapore brought about favorable outcomes. The Korean public will be more supportive of FTA with the EU rather than the US because anti-American sentiments run strong. Nevertheless, he did discuss issues involved with Korea-US FTA and the stance of the Korean government. They hope a deal could be signed next year but predicted continued difficulties. Both governments will hold negotiations in Seoul beginning on July 10. Yet, Mr. Lee said protestors are planning "messy" demonstrations. Americans want to open the Korean market to their agricultural products but Korean farmers strongly oppose this. The EU has disputes too. They believe that the Korean automobile market places strict regulations against foreign competitors. Pharmaceuticals are upset because the Health and Welfare ministry of Korea will not insure some medicines that originate from Europe. Mr. Lee didn't hint at a compromise claiming this is a sensitive issue. Currently, Korea has a trade surplus with the EU over $16 billion and KIEP prognosticates a worsening trade imbalance if the Korea-EU FTA is signed. This might make negotiations more difficult but the president of KIEP remains positive that everything will be resolved. Korea-EU FTA makes good business sense for KIEP but they fear the Korean public will get too emotional and reject the agreement. Mr. Lee reminded the audience that some Korean politicians and their supporters including the media have demonstrated against foreign investors. This luncheon sponsored by the EUCCK was informative. Will there be a Korea-EU FTA signed? The answer remains to be seen but it won't be for lack of effort by KIEP. Mr. Tom Pauken II serves as volunteer contributor for The Seoul Times. A major of political science at Thomas More College in New Hampshire has been writing about his political views on the Asia Pacific region. He taught English in South Korea.